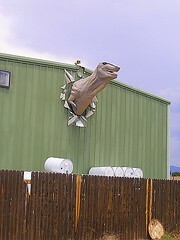 I was saddened this morning to hear about the death of Larry Wilson, the man whose giant spray-foam dinosaurs have amazed travelers south of Santa Fe for more than 20 years. You can read Anne Constable's obit HERE. I interviewed Larry about nine years ago for my "Roadside Attactions" series I did for The New Mexican about weird and wonderful things along New Mexico's highways. I found him to be a very nice guy and way too modest about his art. Here's my section about Larry's creations from the May 30, 1999 issue of The New Mexican. 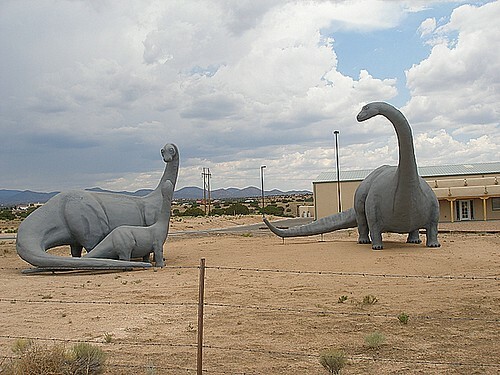 ...the place that some locals refer to as "The Dinosaur Ranch." Actually, it's an otherwise mundane business called Thermal Coatings & Insulation, which specializes in insulating roofs and walls with polyurethane foam. The company had been doing business at the site for several years. But in the mid 1980s, owner Larry Wilson turned it into a roadside spectacle when he built a couple of giant, realistic prehistoric critters out of rebar, wire and polyurethane. Wilson said he's been interested in dinosaurs since his childhood. He built the first one for his granddaughters who were studying dinosaurs in school. "They came and said `Grandpa can you make a dinosaur,' so I said I'd try," Wilson said last week. "Of course, I don't think they were expecting anything that big." Wilson said he had a large piece of rebar that suggested a brontosaurus. "I kept adding onto it and it took on a life of its own," he said. Wilson sold that bronto and three other of his first dinosaurs to the city of Clayton's Chamber of Commerce. "They'd found some dinosaur tracks in an arroyo so they thought this would be a good way to promote that as a tourist attraction," Wilson said. Other polyurethane dinos would soon replace the originals. For the past several years the dinosaur display has featured characters that look like they belong in the 1969 cowboys `n' dinosaurs sci-fi flick Valley of the Gwangi -- a polyurethane cowpoke aside a polyurethane horse, roping a tyrannosaurus rex. In a nearby coral there are more monsters -- a mamma and baby brontosaurus, a stegosaurus, and an honorary dinosaur a giant horny toad. Wooden owls are mounted on the four corner posts, in a futile attempt to keep birds away from the creations, birds presumedly fearing owls worse than they do dinosaurs. Then, over at the company building there's another tyrannosaurus looking as if he's bursting through the wall. "He was originally outside," Wilson said. "But he fell over and broke his legs." Although school classes and church groups often arrange for tours, Wilson said he has to keep his beasts behind a closed fence due to potential liability problems, as well as a spate of vandalism that plagued his dinosaurs about a year ago. Though his dinosaurs have proven popular, Wilson has resisted temptation to cash in on his creations. He no longer sells his dinosaurs. "That would make it a job and then it wouldn't be fun anymore," he said. "Besides, I'm not a good artist. Sometimes I'll have one eye bigger than the other or one leg longer. If I was doing them on commission, I couldn't do that. But when I do them for fun and make a mistake I'll just say this species hasn't been discovered yet."